A debut that blends personal essays and natural history to describe a mountain range in California. 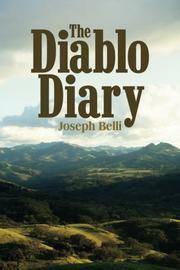 Belli has explored the small group of mountains called the Diablos, located southeast of San Francisco, since he was 3, when his family moved to the nearby foothills. As an adult, he earned a degree in conservation biology at San Jose State University and worked for the National Park Service, surveying the land, animals, and plants in the area. He therefore brings plenty of experience to the 25 essays here. Despite the title, the author offers much more than a diary, competently weaving engaging accounts of his own experiences with information about biology, history, literature, and politics. In “Searching for Dan’l Webster,” for example, he begins by referencing Mark Twain’s 1865 story “The Celebrated Jumping Frog of Calaveras County.” Belli infers that Twain’s frog was a California red-leg because “no other frog in the state could jump like that.” He goes on to describe the reasons for the decline of the red-leg population as well as his own six years surveying Coe State Park to track the frogs’ remaining numbers. In “Of Mice and Man,” he relates a tragicomic story of his personal battle with deer mice and tells of the threat of hantavirus. And in “The Harder They Fall,” Belli describes the California condor with such passion and beauty that readers will feel compelled to look up photos of the bird. Most essays focus on animals, but several look at plants, waterways, and native peoples, showing how they’re all connected. His love for the land provides the writings’ main overtone, but a deep anger—sometimes tempered with sardonic wit—lies not far beneath: “One of the cruel truths about developing an appreciation of nature is that you come face-to-face with the stark reality that so much is in peril.” As noted in the introduction, Belli wrote most of these essays 10 years ago or more, often about events that took place earlier. As such, some details are no longer as relevant, but a newer version, perhaps with references, would likely be essential reading. Informative, provocative, and engaging, if somewhat out of date.